The Isolated Networks step of the wizard is available if you have selected the advanced networking option at the Networking step of the wizard. At the Isolated Networks step of the wizard, you must create isolated networks to which verified VMs and VMs from the application group will be connected and map these networks to production networks where original VMs are located. From the Production network list, select a production network in which VMs from the application group and/or verified VMs reside. In the Isolated network field, specify a name for an isolated network that must be mapped to this production network. In the VLAN ID field, enter an ID for the created isolated network. You can map several production networks to the same isolated network. The production networks that you plan to map must have the same network masks and pools of IP addresses. If you use VLANs in your production network, you can create several isolated networks and map them to different VLANs. As a result, the networking scheme in the virtual lab will resemble the networking scheme in your production environment. 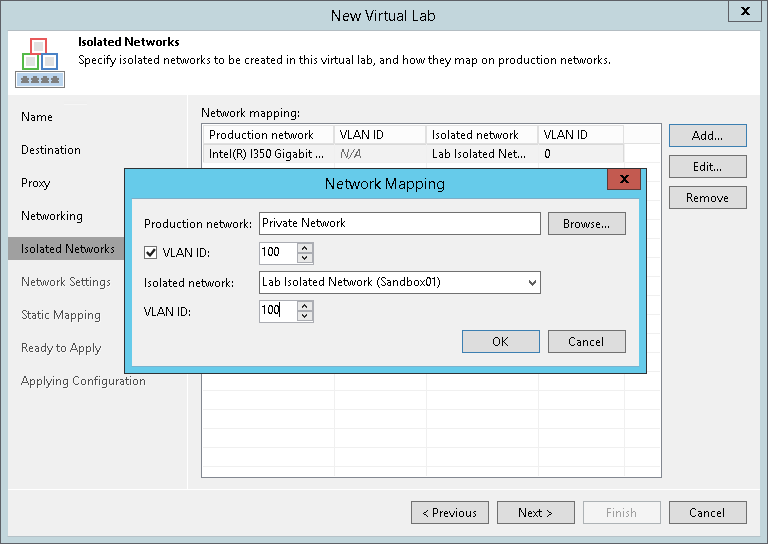 From the Production network list, select a production network in which the VLAN you want to map is created. In the VLAN ID field below, specify an ID of the VLAN in the production network. In the Isolated network field, specify a name for an isolated network that you want to map to the VLAN. In the VLAN ID field, enter an ID for this isolated network. Repeat steps 1-5 for every VLAN in your production network. In the virtual lab, Veeam Backup & Replication will create 3 isolated networks and 3 virtual switches for these networks and connect VMs to corresponding virtual switches. VMs in the virtual lab will function as they function in the production environment.